Art SignWorks, Inc. is an independent family-owned and operated National manufacturing company that specializes in designing and building artistic dimensional carved hand-crafted wood, High-Density-Urethane (HDU), and bronze and brass signs and plaques of all sizes which are completely custom, yet are easily affordable for small and large businesses, government agencies, the courts, the military, police and firefighters, non-profit organizations such as churches and clubs, farms, apartments & condos, and residences. We have two generations of family involved in the business (with a third generation coming up). We were founded in 2005, and are chartered as a Corporation in the State of California. We are certified as a woman-owned small business. For Federal contracts and PO's, we are listed in SAM (System for Award Management), and have products listed on the GSA schedule, as well as on many state and city registries.We sell our custom products retail (factory direct) to residential, commercial, non-profit, military, and government clients throughout the USA. We also sell our products at wholesale prices, to over 400 independent and franchise sign retailers and re-sellers in every US state, and Canada. We are a preferred supplier of carved wood and HDU signs to several National sign companies, including SignWorld, Fast Signs, Signs-by-Tomorrow, and Signarama. Most of our operations and personnel are located on a 10,000 ft2 factory in two adjacent industrial buildings in Murrieta, CA, at 41785 Elm Street, Suite 302, in the Temecula Valley in Riverside County. The Temecula Valley is well-known for its over fifty boutique wineries and vineyards. Our factory is located 50 miles north of San Diego, and about 80 miles southeast of downtown Los Angeles. We are surrounded by beautiful mountains, the highest being Mt. Jacinto, 10,834 ft, snow-capped in winter. Our customer relations staff, project coordinators, computer design facility and manufacturing factory are located at our Murrieta facility. We design and fabricate over 6000 signs and plaques each year in this facility. You can call us M-F 9-5 Pacific time at 951-698-8484 or email us at info@artsignworks.com. Our three customer service representatives will be happy to discuss with you your signage needs. In our factory we have extensive computer design facilities with a network of 9 computers, printers, vinyl cutters, a large sandblast booth (handles up to 14 feet signs), a fully-equipped paint spray booth, and a complete woodworking shop with many saws, routers, sanders, planers, joiners, drills, lathes,and large (4) large-table (5 x 12 ft) computer-numerically-controlled (CNC) routers and 3-D carving machines. We also have our metal shop located there, where we can cut, bend, weld, and coat various metals, and make custom aluminum signs, wrought iron hangers, and steel and aluminum posts and frames. We use a CNC water-jet cutter that cuts elaborate metal and plastic sheet shapes precisely with smooth edges. 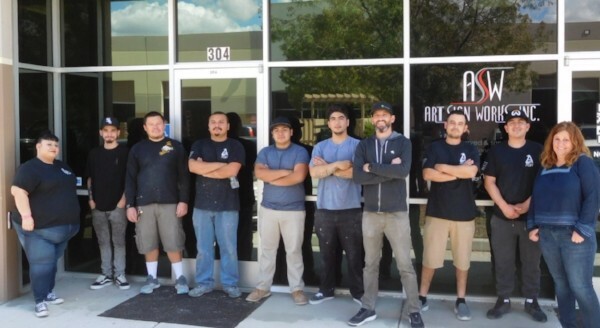 We have a metal-coating and polishing facility (bronze, brass, copper, silver-nickel, aluminum and stainless steel) and a special clean area where we apply hand-crafted gold-leaf and silver-leaf gilding.We also can print full-color digital vinyl for photo or artist painting appliques on our signs and plaques. We have a large heated temperature-controlled drying room where we can cure the coatings on our signs & plaques. We have rigorous manufacturing process, QA and schedule control systems to ensure every sign we make is compliant with client specifications and meets our high quality standards, and is delivered on time. We have a very experienced and professional staff to ensure your signs or plaques meet your expectations. Visitors are welcome any time to our factory during our business hours; we will give you a free tour and show you some sign samples.The short video below shows some of our design & manufacturing processes. Our company's highly experienced staff of 13 craftsmen, artisans, artists, designers and customer service representatives, several who have been with us for a decade, have a passion for fine art and old-world craftsmanship. Our goal is not to make the most signs, but rather to make high-quality, long-lasting, affordable signs that are beautiful and elegant while conveying the customer's message in a clear way. 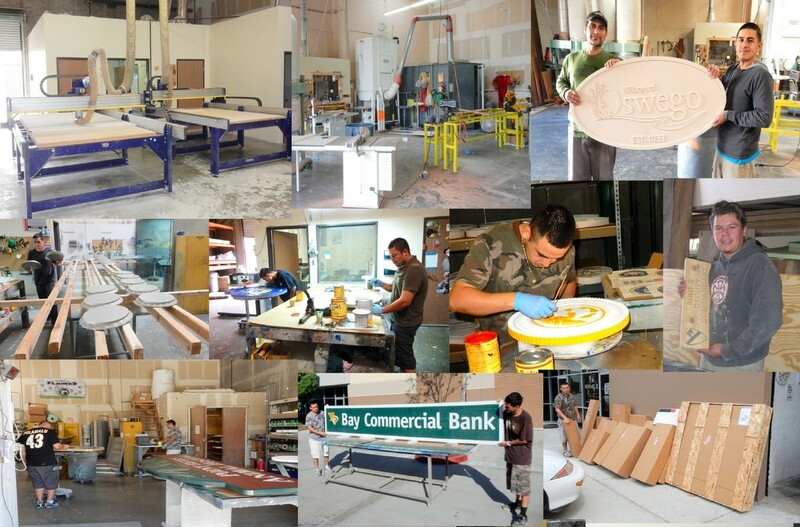 Our team is proud of every sign and plaque we produce, and we hope you will enjoy and value the products we build for you. We stand behind all our products and offer a two-year warranty. We take great pride in our customer service, design capability, and workmanship; we are responsive, creative, flexible, and easy to work with. We guarantee customer satisfaction, even when it costs us. You will find we really are the "Friendly Signmakers"!